The purple tulips were irresistible. The magenta tulips looked ravishing. The pink tulips appeared as dancing dolls. 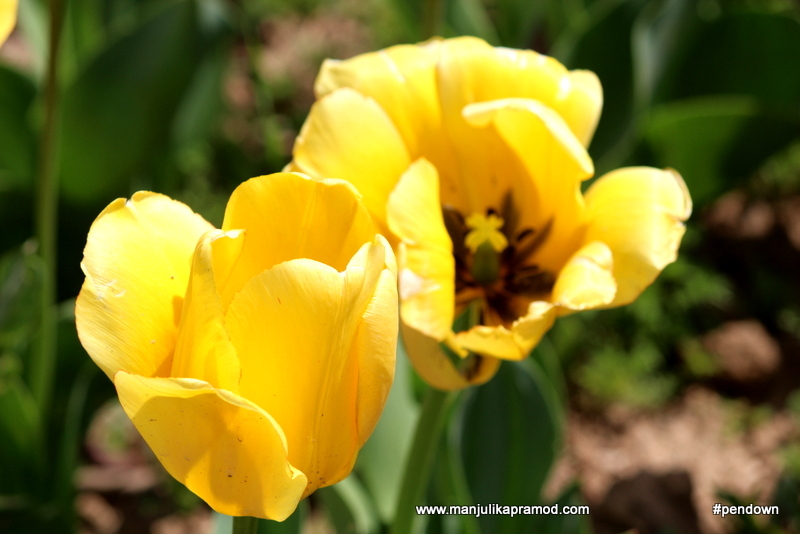 The yellow tulips shone brighter than the sun. The red tulips took my heart away, away, away!!! 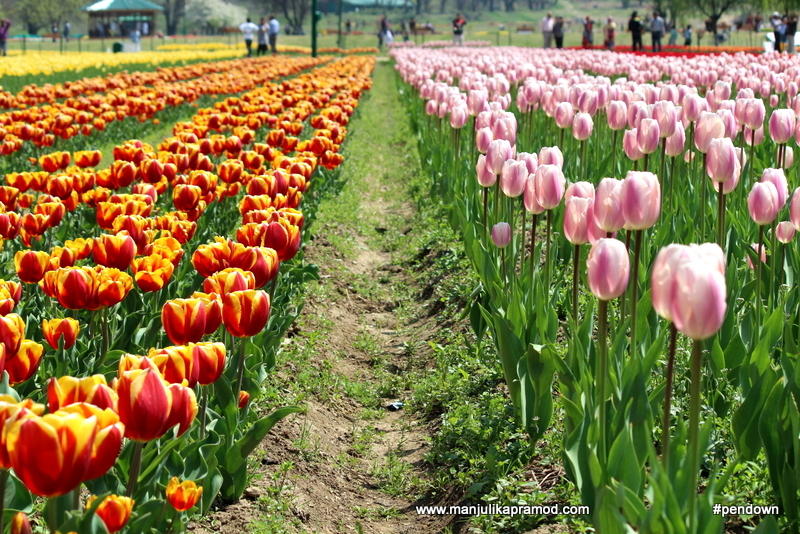 Each year when spring comes in the air of Srinagar, the city is taken over by a fresh bloom of tulips. 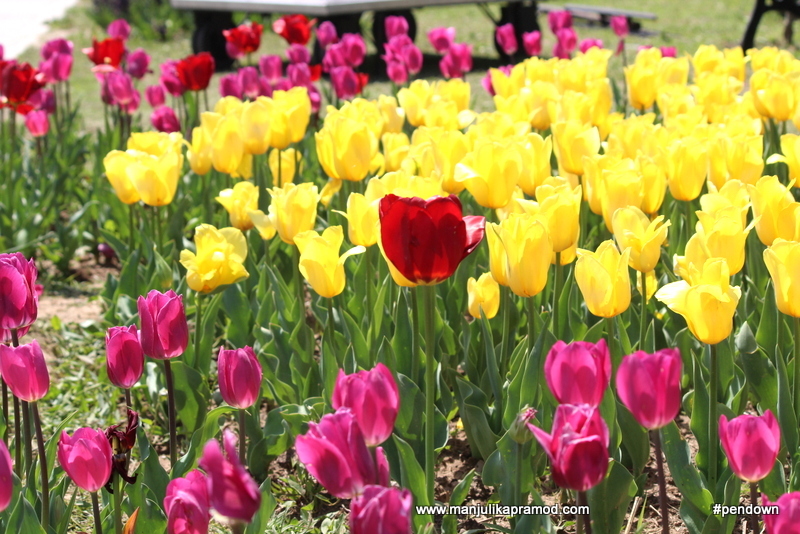 The moment I walked in the Indira Gandhi Memorial Tulip Garden also called the Siraj Bagh in Srinagar, I was overwhelmed with the multitude of colours that met my eyes. The gorgeousness of the place had a magical prowess. It seemed as if many rainbows had decided to come down on earth. There were bountiful blossoms of tulips and I swooned with joy. The prettiness of these divine creations bestowed a spell on me and the effect lasted for the next few hours that I spend in the garden. Overlooking the Dal lake, this 25 hectares of land in the foothills of picturesque Zabarwan range instantly transported me to one of the most beautiful settings of nature. 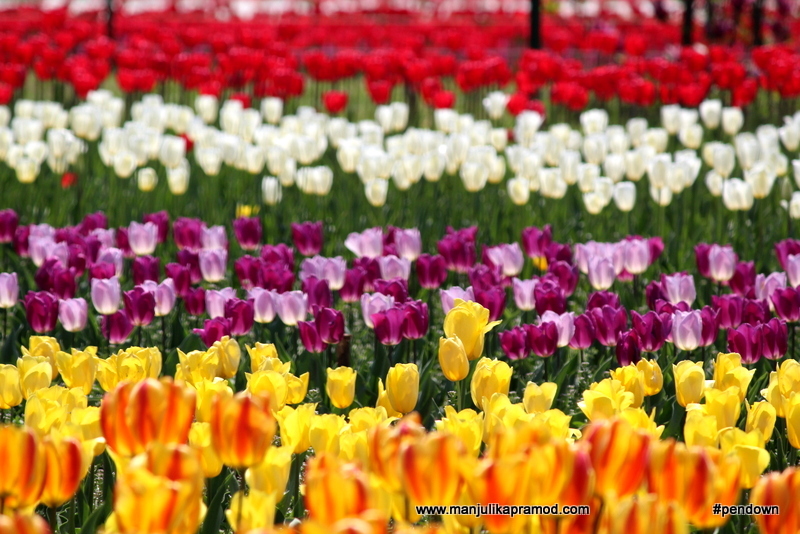 As far as my eyes could see, there were either tulips of varied colour or the admirers of tulips who had come from different parts of the world. This was an unbelievable sight because I had never seen so many flowers of one kind at one place. I had always been fascinated with the tulip gardens of Holland but it had never occurred to me that India had its own second best tulip garden in the world. The Zabarwan ranges in the backdrop enhanced the beauty of the whole garden. As far as the eyes could see, there were either tulips or admirers of tulips who had come from all parts of the country. 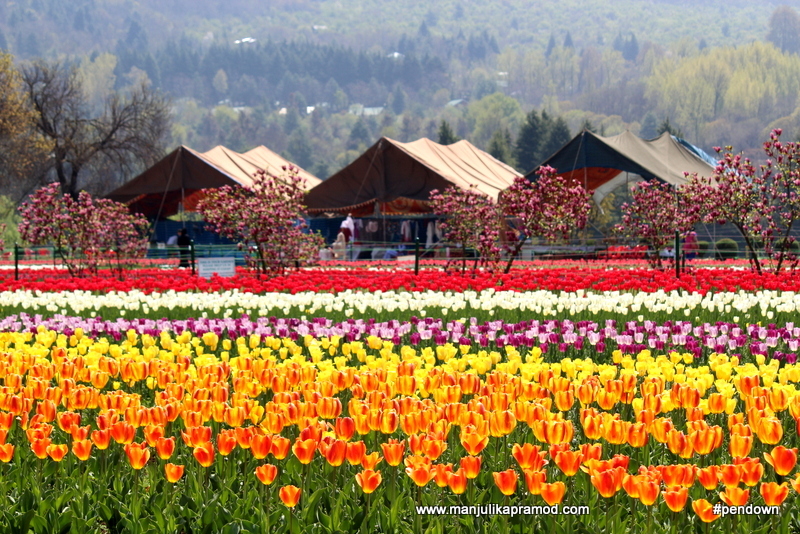 How is TULIP GARDEN OF SRINAGAR connected with TULIP GARDENS OF HOLLAND? Flowers make me go weak in the knees, therefore I couldn’t have asked for a better reason to visit Srinagar in the month of April. 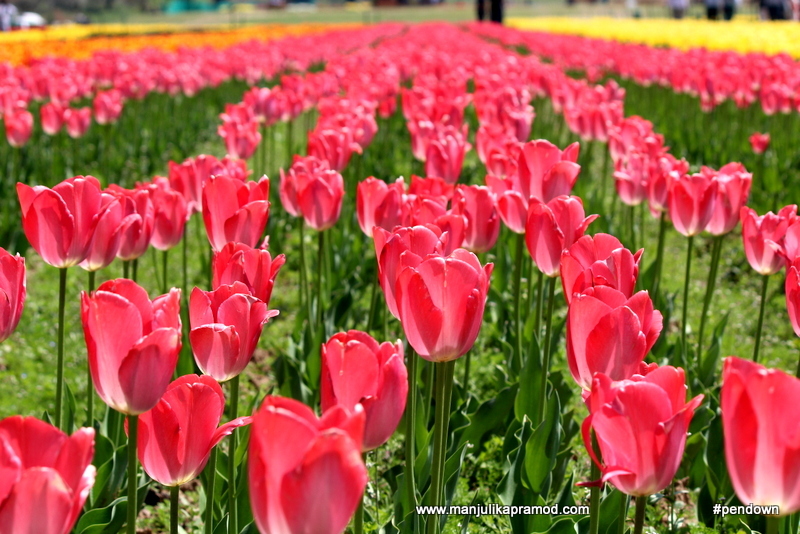 The theme of this bloggers trip was specifically Tulip festival, which is one of its kind in India. Not everyone gets a chance to see this rare collection and I felt blessed. Every year, Secretary Tourism and Floriculture of Kashmir announces the date when the gates of the garden would be open and people from all over the world are warmly welcomed to witness this spectacle. These are fifteen precious days which you must keep track of. This year the dates were 1st April to 15th April. The garden is still open for a handful of days because a few other varieties of flowers have also been grown and their life is more than the tulips. As part of the celebrations, some cultural performances were also planned for the last day of the festival as part of ‘Bahaar-e-Kashmir’ event but it could not take place. I visited the garden on 14th April 2017. As I walked around, first I couldn’t stop clicking pictures, later I sat down and savored in some happy moments. Last but not the least, I talked to some people and learned that a study had been done by the agriculturists, scientists and researchers along with State Floriculture Department of Kashmir and together they had discovered that valley’s unmatched weather conditions were just perfect for the growth of tulips. For few seasons, it was grown as part of the research. The response was amazing and such that many farmers have taken it up as a seasonal occupation. I knew there had to be a connect to Holland for sure. Yes, there is. The bulbs of these flowers are brought from Holland, sown and grown in here. Check these Kashmir Tour Packages! These flowers can be your reason to travel to Kashmir in the coming years. I am glad that as a whole a number of people have worked and tapped into this new potential for the state. Ever since the tulips have been grown here, here is a huge demand for them in different parts of India too. No doubt, this lavish festival it has enhanced the tourism factor of the city. People from different parts of the world visit Kashmir only during this time. I loved the scenic setting and the lushness of the flowers. It felt as if I was walking on a carpet that was laden with flowers but of all these things, I genuinely felt that these amazing flowers could have been grown more creatively. These vertical and horizontal rows of tulips could have been replaced by innumerable designs to make it more appealing and attractive to the eyes. I say this because I have an undying love for flowers and I really want this festival to flourish more and more. Also, my thoughts are influenced by my visit to one of the best gardens in the desert, Dubai Miracle Garden. The beauty of the garden was enhanced exponentially by these gorgeous creations of nature. Every travel experience helps me learn and discover something new and I never miss a chance to educate myself a little more. After I came back home, I decided to read more about these pretty flowers! Tulip belongs to the lily family. After Rose and Chrysanthemum, tulips are most popular flowers. A single tulip flower has six petals. It grows best in cold winters and dry summers. Tulips have a life not more than 7 to 15 days. 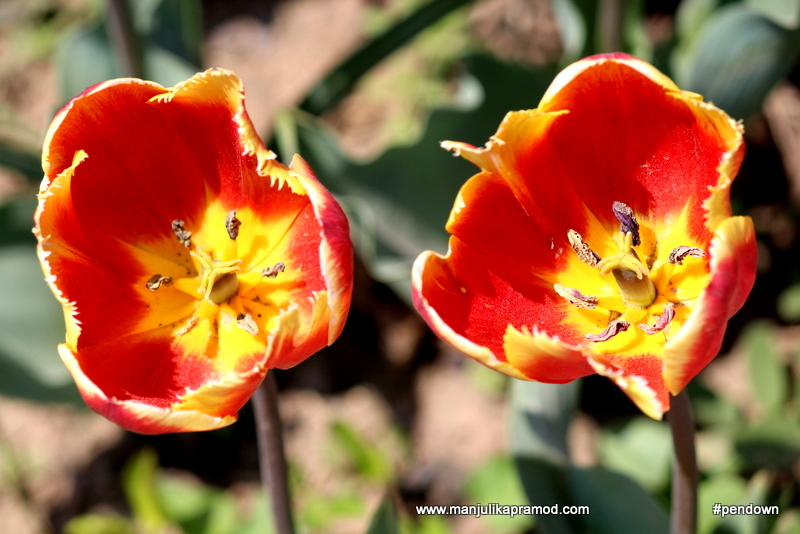 75 wild species of tulips and 150 species are known for now. Tulips get their name from a Turkish word ‘tulbend’ which means turban. Most of the times there is one flower per stem. I regularly read updates from TULIPS IN HOLLAND.com and I would love to tag them. Thanks to Jammu and Kashmir tourism and Kashmir Trails for making it possible. These pictures have left me spell bound. For sure, I need to plan a trip to Kashmir for these beautiful flowers. Beautiful photos… so many colors and types of tulips – simply spellbinding. Such beautiful scenes. 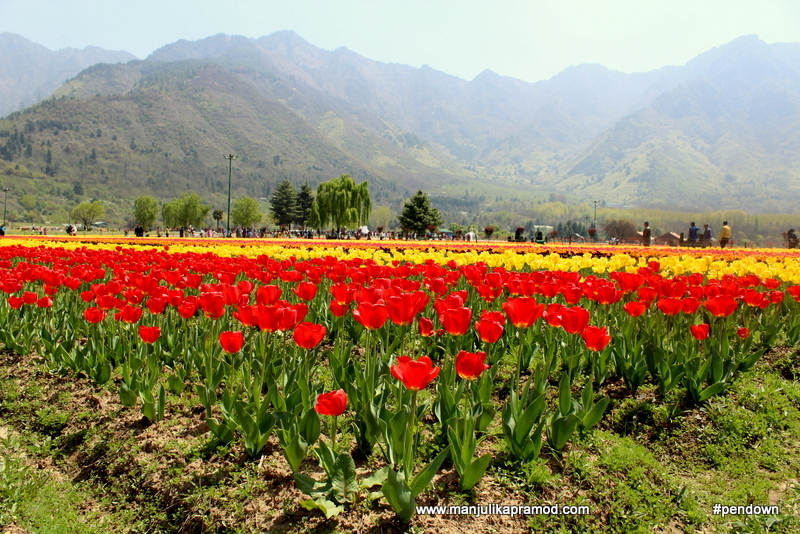 No wonder, every year thousands of tourists flock to Srinagar to enjoy the Tulip festival. The gorgeous background of might mountains make it all the more atmospheric. I have seen many tulip festivals or seasons all over the globe but these have a different glow! The colors are so vibrant and radiant. I can only imagine what it was like to experience it in person. Oh my goodness! I just returned from Amsterdam, where I visited Keukenhof and saw all the awesome tulips. That piqued my interest in tulips… but I thought I’d have to go back to Holland to see some more. I had no idea that you could find them in Kashmir! So cool! Your pictures are GORGEOUS and totally make me want to visit Kashmir! These gardens look lovely and Love the. Connection to the Dutch gardens ! Beautiful photographs Manjulika.. I so want to be here. Maybe next year now. There are a lot of benefits as well as insightful information in this post. I’ll have to come back as well as go through it once again so I can evaluate some of your own viewpoints. This particular is actually a terrific article.